When comparing the ancient ruins of the world, Túcume might be the most fascinating site that most people have never heard of. Located 21 miles to the north of Chiclayo, Túcume is home to 26 pyramids that were built over 1,000 years ago. One of these pyramids—Huaca Larga—has a base that is over 2,000 ft. in length and was the largest pyramid in the world. Due to heavy rains, however, these dusty, sand-carved, ancient pyramids have been reduced to eroded mounds, although archeological discoveries continue to be made in the burial chambers below. At Huaca Larga, 119 bodies were discovered deep beneath the pyramid, and evidence suggests that the bodies were part of a mass human sacrifice to the gods. Other findings are less grotesque, such as the murals and carvings of the Lambayeque god Naymlap, a revered deity who emerged from the sea and gave rise to the powerful city. As the ancient people of the Lambayeque Valley constructed these towering pyramids, they subsequently abandoned the massive structures when they felt it would please the gods. Today, the area around Túcume is still largely abandoned, the main reason being that local villagers are wary of the spiritual past; only healers and traditional shamans will visit Túcume by night, and there is a palpable sense of power and history when touring Túcume today. 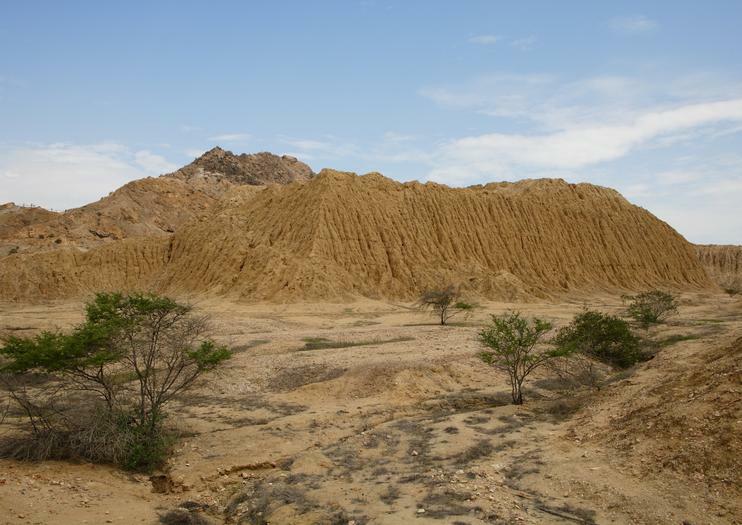 Túcume is located 20 miles from Chiclayo and is accessible by car or taxi. The drive from Chiclayo is about 30 minutes, and it’s a convenient stop on a visit to Batán Grande or the Royal Tombs Museum of Sipan. When touring Túcume’s 540 acres, the trail leading up toward Cerro Purgatorio provides the most striking views of the ruins.